Will Travis – who, until recently, headed the Bay Conservation and Development Commission, a state agency that regulates building around the bay – says, sure, big development projects happen all the time in the Bay Area. But Lawrence Berkeley labs is what he calls “a platinum level, marquee” project. Since it was founded in 1931, thirteen Nobel prizes have been won on work done here. Sixteen elements added to the periodic table. World-famous innovations in medical science, alternative energy and atomic research that helped win World War II. With a staff of 4,000 and a budget of more than $800 million, the Lawrence Berkeley Lab has been overflowing its headquarters in the Berkeley Hills for some time. Research on biofuels and other fields has spilled over to satellite offices in Emeryville and Walnut Creek. The idea is to consolidate those operations into a second campus. For several Bay Area cities, this seems like a dream opportunity. On a blindingly sunny day in November, Alameda city development manager Jennifer Ott took me on a tour of Alameda’s contender in the race: a 50-acre waterfront property in the Alameda Naval Air Station. Gesturing to what now looks like a concrete wasteland – albeit with a spectacular Bay view – Ott described a bustling campus and waterfront promenade. Retail shops and restaurants, a jogging path. She says when the Navy decommissioned the Air Station 15 years ago, the city lost thousands of jobs. The lab would be a chance to bring this area back to life. Ott says It’s still worth it. The need for jobs unites all six of the possible sites. But here’s something else many of them have in common: They’re flat and by the water. And that presents a problem that no one has much experience dealing with says Will Travis. San Francisco Bay waters are expected to rise steadily in coming years: 16 inches by 2050, up to 55 inches by the end of the century. But the more imminent threat, says Travis, is storms. “The scientists are telling us that we will have more extreme events more often. And we’re seeing it. Travis believes that sea-level rise is something that can be designed around with stilts, or artificial hills, setbacks. His former agency, the BCDC is charged with writing those guidelines. But at a certain point, says Heather Cooley, of the Oakland-based Pacific Institute, there will be places simply not worth developing. Places we will just abandon to the rising waters. “We will need to have those sorts of conversations,” says Cooley. But she adds that nobody in the Bay Area seems quite ready to have them yet. Other hard conversations are taking place just north, near the Albany/Berkeley border at Golden Gate Fields. On the day I visited, a thoroughbred named “I’m Tops” is getting a pedicure, his hooves filed down and shiny new aluminum shoes fitted with nails and a hammer. “This is a dying art,” said Peter Tunney, my guide and a member of the Stronach Group, the private racing firm that owns this racetrack and others. Tunney has been in the racing business most of his adult life. But he said betting had declined in recent years. Sometime, the grandstands were only half-full. If Lawrence Berkeley chooses this spot to put its new campus, the racetrack, built in 1941, would be torn down. The lab would either buy the property, or lease it from the Stronach Group. Racing would continue, said Tunney, just somewhere smaller inland like Pleasanton. If the lab chooses Albany, there will be some hurdles. Birders say the construction could damage precious habitat near the track. One final option is to build out the Richmond Field Station, off of I-580, and just north of the racetrack. 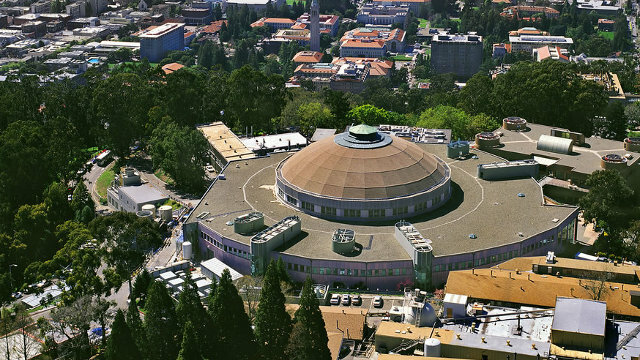 The Field station, which Lawrence Berkeley Lab already owns, currently houses several scientific projects, including an earthquake simulator and UC Berkeley’s Forest Products Lab. A spokesman for the lab says a decision should be out within the month. They hope to have the new facilities up and running by 2016.